Every time I type the words "fruit salad," they are inevitably followed in my head by "yummy yummy." Thanks for my childhood, The Wiggles. 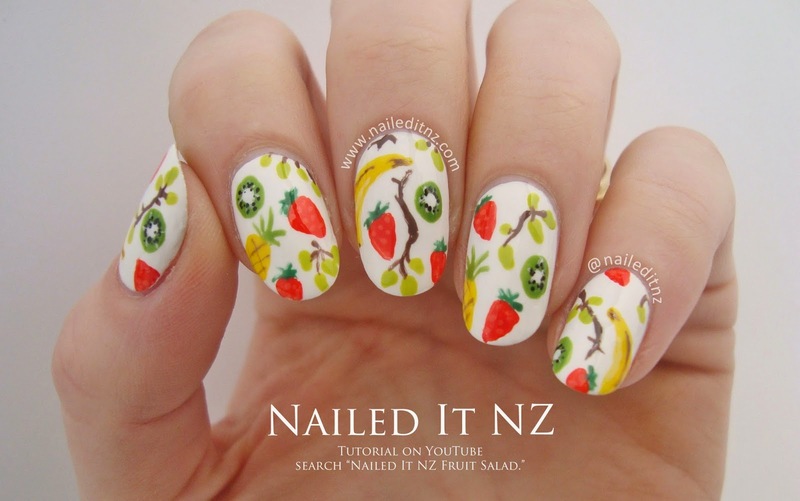 Today I've got some fruit salad nail art to show you, plus a tutorial for it! 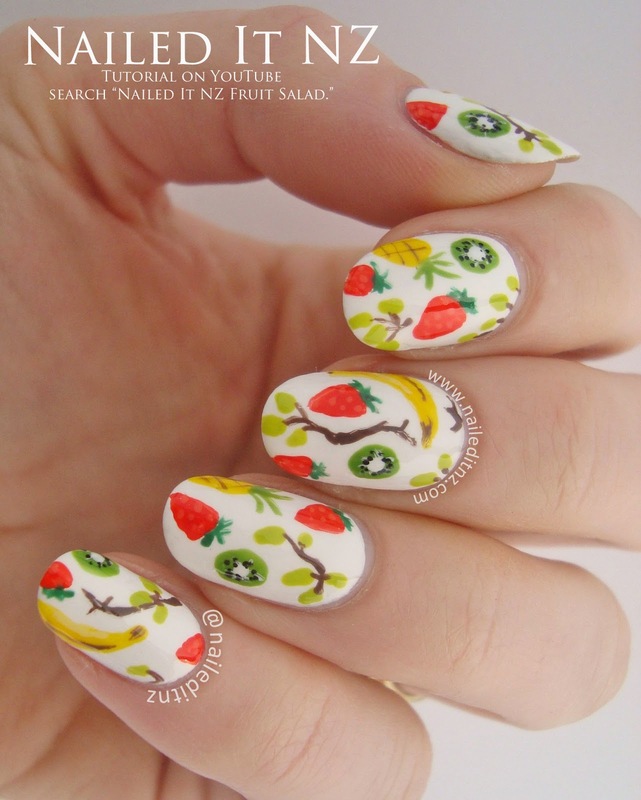 I've done a lot of strawberry nail art recently and decided to try adding some more fruit in. I'm really happy with how it turned out! As you can see, there are pinepples, grapes, kiwifruit, strawberries and bananas. Here's the tutorial, and please subscribe to my YouTube channel if you're not already, I upload twice a week ☺. A lot of nail bloggers post pictures where they're holding something, but I can never find something quickly that's a) relevant and b) pretty. I figured this banana met one out of two of these criteria, at least! On a side note, I'm currently wanting to boycott the mainstream media. I'm so angered at what they did with Jennifer Lawrence's photos - not just the initial hacker but all the people who were spreading them. A long time ago I wanted to become a journalist, but decided not to because a) you have to write what your editor tells you to write and b) it's a dying art - bloggers are taking over. I can't WAIT for bloggers to take over. At least there's a variety of opinions, and honest ones. Not just a handful of major companies who control and filter 90% of the things the public see and read. Part of me wants to make a big ranty YouTube video about this, but in reality J-Law probably just wants it all to go away - and I won't help drag it out more than this paragraph. I know there are plenty of good journalists/radio hosts out there - I've got a friend that is one of them, but it's usually the bad ones, that chase scandals and drama, that make it big. Rant over. Back to nails. 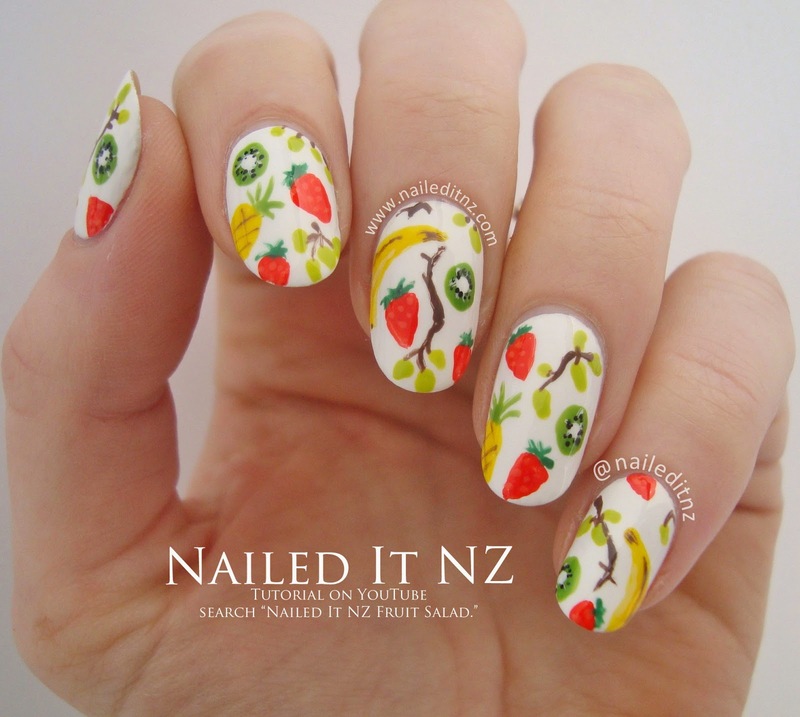 Hope you like these nails and the tutorial - oh, and what do you think of my new header and YouTube intro? Jessie, these are super cute, cheerful, and youthful! By the way, did you change your nail shape? I thought you used to have "squovals." Yup, a while ago though! I had squovals for quite a while but I'm an oval/almond girl at heart :). 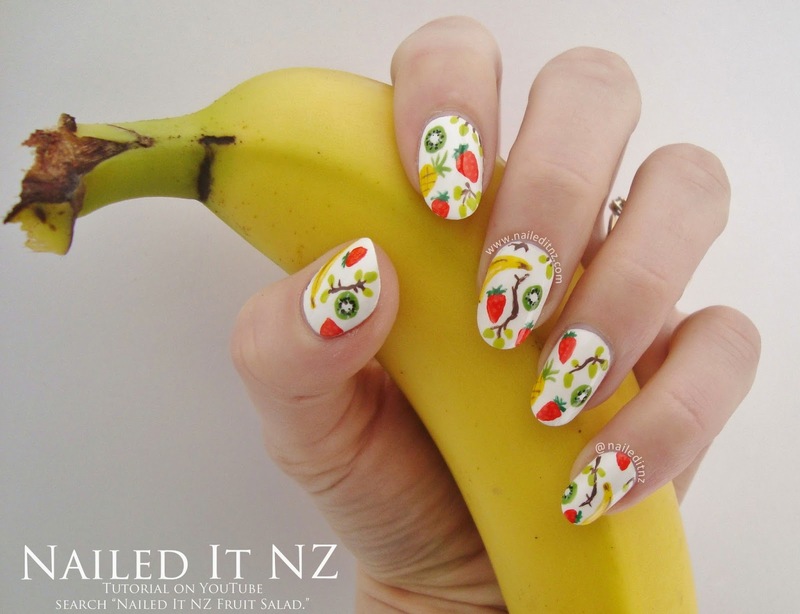 These nails look great - nice Banana prop too! They are so detailed! It really annoyed me about what happened to Jennifer Lawrence too!